National Running Day was yesterday, and it was quite the exciting day for runners around the country. Many races offered 1-day sales, running stores had all kinds of promotions, and there seemed to be nothing on twitter but running day love. Dare I say, it was almost a little too much? Do We Really Need a National Running Day? What is the point of National Running Day? Was it created to help bring runners together as a community? To encourage non-runners to take up the sport? For some other reason? Is it just a time for us runners to talk about our PRs to our non-running friends? Because seriously, we all do this WAY too much already. Non-runners already tend to dislike us as it is, whether it’s because we cross the street without looking, blow snot rockets without missing a beat, or simply because they are secretly jealous. Do we really need to rub it in their faces by having our own “holiday”? The thing that I love most about being in the running community is how supportive we are towards each other. Whether you’re on Day 1 of Couch-to-5k, or you run freakishly long races, other runners are always willing to offer encouragement, advice, a gel, water, or anything else you might need a long the way. Case in point–I recently flew up to Virginia to run the Blue Ridge Marathon, and a fellow runner that I had never met in person asked me if I needed a ride from the airport to my hotel? 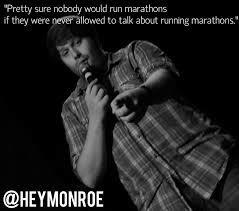 Who else would do that besides another runner? That’s right–no one. I hope you were able to enjoy a run yesterday, Nikki. And thanks again for the ride. The only thing I don’t like about designating the first Wednesday of June as National Running Day is that it only happens once a year. But the spirit of National Running Day is within us each and every day, and that is something that I’m going to keep in mind on this blog and on the twitter going forward. Yesterday, we were all willing to support and encourage runners of all shapes, sizes, and speeds. If you want to support and encourage other runners every day, and not just on National Running Day, I want you to join my tribe as a member of my new Facebook group. I want to cheer for you during your races, and I hope that you’ll cheer for me during mine as well. Because that’s what the community, running or otherwise, is truly all about. 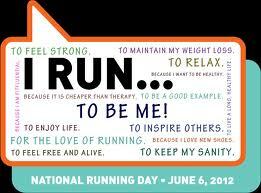 Let’s Keep the Spirit of National Running Day Alive for 365! Feel Free to Share This Post on Any and All Social Media Channels, and Please Invite Other Runners to Join Us!